I've read numerous articles and videos about how the russian industry is one of the most enviromentaly unfreindly ever built and in siberia a town(cant remember its name) that has a huge amount of birthdefects present in its are population due to the nearby plant releasing very toxic nonfiltered chemical smoke(or something of that sort) and the nearby enviroment is suffering a lot from it. There could be numerous factories of the soviet producing lots of tozic discharge. Are there currently any industrial centers in russia using renewable enrgy or having more enviroment safety considerations? If not in my opinion renewable forms of energy(especially electricity) would greatly easen the strain on russia's natural resources and and would be cheaper for the long term. Of course I'm sure 99% of major russian politicians dont give a flying ***k if in the near future the taiga will become a toxic wasteland or if the oil or natural gas runs out. I doubt the stupid oligarchs would allow a renewable energy initiative if someone actually proposes it. For the sake of fairness none of the US oil corporations and government care too much about it and would prefer to invade a middle eastern country to take its resources but the europeans (especially the skandinavians) are now spending a lot on clean energy. So do you think russia has enviromental problems to solve and should start ivesting in renewable enrgy or do you think the problem is nonexistant and the government shouldnt be wasting its precious money on this and continue to fund military and oil production. Such reports and documentaries the west picks up and broadcasts, but western documentaries talking about problems in the west are sat on. I am sure there are plenty of environmental problems in lots of places in Russia. I also agree that developing cleaner and greener energy sources is key. The problems can be pretty severe but fortunately only in several specific places. And the same could be said for any country on Earth. The huge irony is that if you mention environmental wasteland and Russia... most westerners will automatically say Chernobyl... and anyone who knows even the slightest bit about Chernobyl knows it is in the Ukraine. And of course the Aral sea that dried up because Kruschev went to the US and saw what irrigation did for the US and decided to do the same in the Soviet Union, of course that is not in Russia either, but some work in building dams has allowed some of the enormous lakes to be restored with hope for the rest. So yes, there is pollution in Russia, and yes they need to develop new technologies to deal with it and new forms of electricity generation to prevent more pollution. Ironically however one of the most promising technologies is nuclear power generation that does not put carbon into the atmosphere and is now a mature and relatively safe technology. But then even hydro electric dams can eliminate large areas of potential farmland, and there is always the threat of damage via earth quakes and deaths by flooding. Downvoted for marine biology center? Yep, that was weird. Just gave you a positive vote to compensate for this nonsense. KHABAROVSK, August 14. /TASS/. A Siberian tiger cub from a species threatened by extinction was found shot dead in the Khabarovsk region of Russia’s Far East, local officials said on Friday. Cycling tourists found the cub, less than 8 months old, on July 29, filmed the body on their cell phones and alerted police. Officers were unable to find the body but video material was enough to open a criminal case. Siberian tigers are on the Red List of endangered species and are legally protected under Russian law. Slaying is punishable by seven years in jail and a $31,000 fine. ULAN UDE, September 15. /TASS/. The water level at Lake Baikal, the world’s largest freshwater source, having dropped to critical marks in April, may fall by another 28 centimetres next spring, the head of the Baikal Institute told TASS on Tuesday. "This year, the lake’s water level fell to 455.86 metres in April. In the spring of 2016 it may drop by 28 centimetres to 455.58 metres," Yendon Garmayev said. Decline of the south Siberian lake’s level began last autumn and reached its critical mark in spring for the first time in decades. Scientists explain the phenomenon by low water inflow from the Selenga, Upper Angara, Barguzin and other rivers draining directly into the world’s deepest lake. Lake Baikal, a UNESCO World Heritage site since 1996, contains 20% of the world’s freshwater reserves. VLADIVOSTOK, October 5. /TASS/. A million-hectare Far East national park for endangered-species Amur tigers will be completed by the year-end, Natural Resources Minister Sergey Donskoi said on Monday. "Bikin national park will open over an area of 1.1 million hectares covering the Amur tigers' main habitat," Donskoi said. It will be located along the Bikin river, close to the Chinese border. A national programme to protect the tigers was adopted in Russia in 2010 after the country hosted a "tiger summit" - an international forum devoted to preserving tigers as a biological species. President Vladimir Putin signed tougher punishments into law in 2013 for killing and trafficking rare and exotic feline species, including Amur tigers. The Russian Geographical Society set up its Far East Amur Tiger Centre on the head of state's initiative. VLADIVOSTOK, October 14. /TASS/. The shrinking of Lake Baikal, the oldest and deepest freshwater reserve in the world, is connected with climate changes in the Asian region, characterized by less rainfall and higher air temperatures, suggest scientists from the Far Eastern Branch of the Russian Academy of Sciences. "A sizable decline in the past few years in the sums of atmospheric precipitation in the Baikal region, Mongolia and Buryatia along with anthropogenic factors have led to a drastic decline in discharge from the Selenga River into Lake Baikal, which triggers the shrinking of this unique lake," a scientific conference in the Far Eastern city of Vladivostok heard. This river provides the lake with up to 50% of water inlet. The situation has worsened this year amid woodland fires covering big areas in Buryatia. The spread of fire raised the already abnormally high temperatures in the region, causing more evaporation. Economic activity in Mongolia also affects the water level of Lake Baikal. Lake Baikal in south-east Siberia, the deepest lake in the world (1,700 m), contains 20% of all fresh running water on the planet. Located on an area comparable with that of the Netherlands, it is the biggest reservoir of fresh-water on the Earth. Water level in Baikal is regulated by the Irkutsk hydropower plant on the River Angara outflowing from Lake Baikal. Experts say the lake’s shallowing may carry such threats as losses in productive efficiency of the hydropower plant, the lake’s ecosystem imbalance and threats to fish spawning areas, subsoil water level lowering in coastal areas fraught with peat bog fires. Since 1962, Baikal’s water level dropped below the critical mark more than ten times. Thus, in 1982, water level sank to 455.27 meters. But the subject of Baikal’s possible shallowing was seriously raised only in 2001. A World Lakes Conference in Japan’s Otsu put Lake Baikal, along with Lake Okeechobee in the United States (with a depth of three meters), Lake Balaton in Hungary (with a depth of 12 meters) and the Aral Sea located at the border of Kazakhstan and Uzbekistan (up to 50 meters deep), on the list of the world’s largest fresh-water lakes facing the biggest threat of deterioration. MOSCOW, October 20. /TASS/. The Russian Ministry of Natural Resources suggests reducing limits of marine water conservation zones on Russian islands tenfold to 50 meters for the purpose of facilitating development of construction materials deposits on such territories. Amendments to the Water Code have already been sent to the Justice Ministry for preparation of a conclusion, the ministry said on Tuesday. The Russian Water Code currently bans exploration and production of widespread mineral resources within limits of water conservation zones, whose width is 500 meters. Implementation of this norm of law results in impossibility of developing deposits already explored and booked at the state balance, the Ministry of Natural Resources said. The ban adversely affects the economy of the Sakhalin Region, particularly the construction sector using inert construction materials. 90% of sand deposits on the Sakhalin Island and 100% sand deposits on the Kuril Islands and up to 50% of construction stone deposits are located within limits of water conservation zones of seas. The majority of them are located in desolate locations and no alternatives for such deposits were found on the Sakhalin Island, the ministry said. Impossibility to mine widespread mineral resources in water conservation zones of seas will later entail the need to deliver them from the mainland Russia or abroad, entailing cost escalation and longer timeframe of construction work, the Ministry of Natural Resources said. Male, female and two cubs spotted in Ak Cholushpa Nature Park in Altai Republic. Russian Ministry of Natural Resource and Environment claimed that Baikal Lake is dying, due to Mongolia's hydroelectric dam in Selenga River. Selenga River supply 80% of water into Baikal. I wonder will there be a joint meeting between two countries about alternative energy solution - some sort of nuclear power plant in Mongolia ? it says baikal level could be lowered because artificial lakes take time to fill up, mongolia needs this medium sized hydro plants because its burning coal for electricity, and importing from russia, and has no hydrogeneration at all which is apsurd for a mountain country. ULAN-UDE, July 30. /TASS/. Russian Nature Resources Minister Sergei Donskoi on Saturday tasked officials who earlier designed a massive conservation project for Russia’s world-famous Lake Baikal to think about sources for its financing. Work on the draft project, estimated at 500 billion rubles ($8.4 billion at the current exchange rate), began in 2016. The document is currently being finalized by a group of officials, including from the governments of Siberia’s Republic of Buryatia and Irkutsk Region, and is expected to be ready in the second quarter of 2018. "I suggest that everyone does his best to think of possible sources [of financing]. Because without it we will find ourselves in a situation of a serious deficit," Nature Resources Minister Sergei Donskoi said at a meeting of the intergovernmental commission on the protection of Lake Baikal. "The declared expenditures are significant and are estimated at hundreds of billions of rubles. There is a plenty of tasks, but the issue of financing remains uncertain," the minister said. According to the official, the current federal program on the conservation of the world’s largest freshwater lake, as well as on the social and economic development of adjacent areas, fails to achieve the intended goals. MOSCOW, November 24. /TASS/. Rare Atlantic walruses have been spotted in the White Sea again after several hundreds of years of not appearing in the area after unlimited exploitation, research fellow at the Shirshov Institute of Oceanology Alexander Agafonov told TASS on the eve of the Walrus Day. "Atlantic walruses are still considered endangered species. Their population decreased initially because of intensive exploitation. For instance, they have not appeared in the White Sea since the 18th century. However, our records indicate that walruses returned to the White Sea, which most likely signals a positive dynamic," Agafonov said. It is currently prohibited to hunt Atlantic walruses. 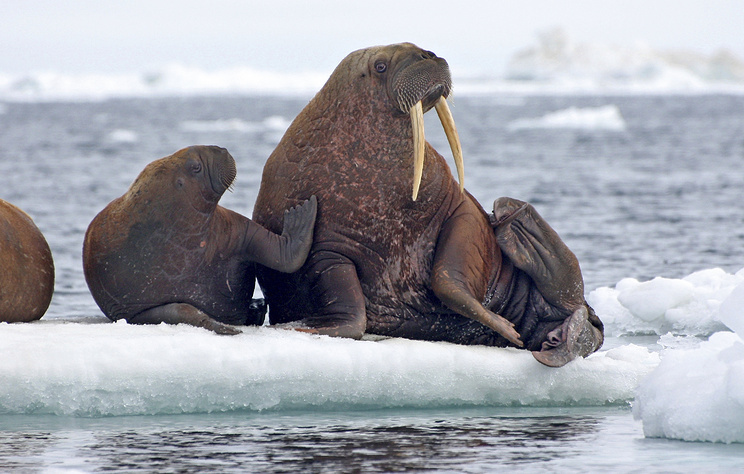 When it comes to Pacific walruses whose population is currently estimated at 200,000 animals, only indigenous peoples are allowed to hunt them in limited quantities, Agafonov noted. Ocean pollution does not directly affect populations of walruses but can lead to decrease in fish supplies for the rare animals, especially in case of technogenic disasters like large-scale oil spills, the expert said. Senior research fellow at the Shirshov Institute of Oceanology Vasily Spiridonov noted that there is no worrisome information yet about populations of Atlantic walruses but it is important to watch them closely as no concrete data on their numbers is available. There is another problem that concerns mostly Pacific walruses - global warming forces them to migrate north as ice pads in the Bering Sea gradually melt. Thus, competition for ice pads in the north of the Pacific Ocean grows rather quickly, the expert explained. MOSCOW, February 18. /TASS/./TASS/. Dozens of polar bears who have been besieging the Belushya Guba settlement on Russia’s Novaya Zemlya archipelago for over a week, have left the area, a source from the Arkhangelsk regional department of the Russian Federal Service for Supervision of Natural Resources told TASS on Monday. On February 9, the Novaya Zemlya Archipelago, located in the Arctic Ocean in the Arkhangelsk Region in Russia’s North, declared a state of emergency after dozens of polar bears had ‘invaded’ local settlements. At least 52 polar bears were spotted near the settlement of Belushya Guba, some of them acting aggressively or breaking into homes and offices. A group of scientists and experts was airlifted to the archipelago on February 14 to deal with the problem. "No bears have been spotted in Belushya Guba or around it for the past 24 hours," the federal service said. "Their numbers have thinned out near the other settlements compared to the previous week," the source added. He said specialists and local authorities, military and law enforcement officers continue patrolling the area and monitoring the situation. Tranquilizing the animals and attaching devices to them to track their migration is now being considered. Earlier, head of the Novaya Zemlya administration Zhigansha Musin told TASS that the local commission for emergency situations had made the decision to lift the state of emergency on February 19. He said the bears had left once ice had amassed, and also due to the activity of a group that was chasing the bears away from local settlements. VLADIVOSTOK, April 5. /TASS/. Authorities of Russia’s Far Eastern Primorye Region are set to create a rehabilitation center for marine mammals this year on the region’s territory. According to the plan, it will be located in Srednyaya Bay where 10 orcas and 87 beluga whales are kept now, the region’s Governor Oleg Kozhemyajko told reporters in Vladivostok. The governor said Srednyaya Bay would be a suitable place to create a rehabilitation center for cetaceans, but he did not name any exact timeframes then. "We are moving towards creating there [Srednyaya Bay] a rehabilitation center because near our shores marine mammals get in trouble from time to time or they are thrown. That’s why we are facing the task of adapting and treating them, and to ensure that they are in normal conditions, and we are discussing this issue with scientists. <...>This year a rehabilitation center will be opened in Srednyaya Bay," the governor said. Water samples have been taken from both Srednyaya Bay and Paris Bay, but the first place is expected to be preferable. The governor noted that the authorities together with scientists will start drawing up a roadmap soon. The creation of a rehabilitation center soon will help release cetaceans after treatment or send some of them to local dolphinariums.